NewAge Casting is a global manufacturer and provider of a wide range of cast iron products. 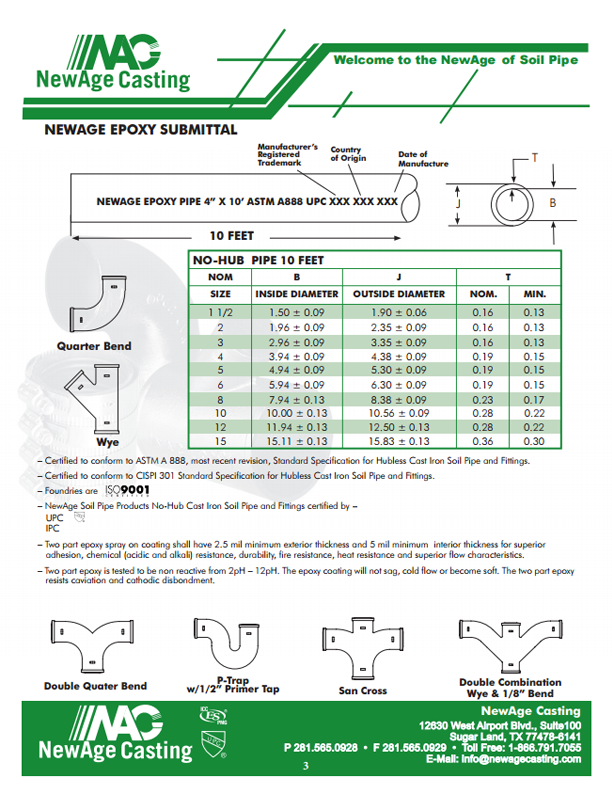 NewAge’s premier product line is the extensive Cast Iron Soil Pipe System. The NewAge System consists of a full line of No-Hub, Service Weight, Extra Heavy Pipe, Fittings, NH Couplings, Heavy Duty Couplings and SV and XH Gaskets. Our quality is ensured through NewAge quality control procedures that meet and exceed the requirements of American Society for Testing and Materials (ASTM) and other national standards. Our products also undergo third party inspection by International Association of Plumbing and Mechanical Officials (IAPMO/UPC) on a consistent basis. NewAge Casting is fully committed to the commercial plumbing industry by offering the only true alternative to the traditional suppliers of cast iron soil pipe products in the USA. We are very proud to offer the highest quality products with state of the art packaging, to assist the plumbing contractor’s labor efficiency. We understand the current challenging economic times and we at NewAge Casting are here to offer solutions to our wholesale customers and not more challenges. Thank you for visiting our web site and we encourage you to contact your local NewAge Casting sales representative for a more detailed presentation of what we can offer your company.